Last month we received a very fitting gift on behalf of Tim Peake. Our friends at the National Trust’s Woolsthorpe Manor – the birth place of Sir Isaac Newton and the site of the apple tree that inspired his theory on gravitation – presented us with several seeds from the most famous apple tree in history in the hope that we can make them part of Tim’s mission and maybe even send them to the ISS. 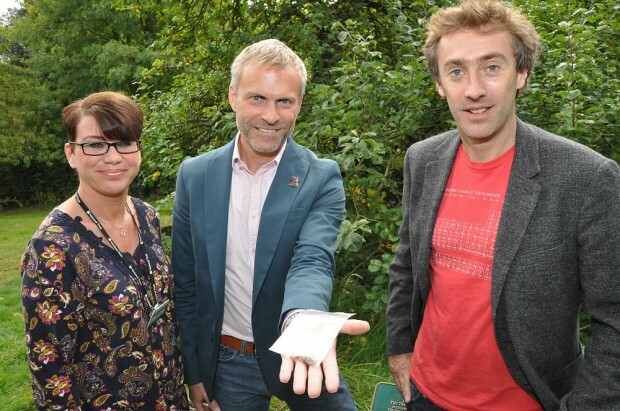 From left to right: Jannette Warrener, Custodian of Woolsthorpe Manor, Jeremy Curtis, Head of Education at the UK Space Agency and TV personality Dallas Campbell. Famously pondering why apples fall from trees, Newton not only wrote down the laws of gravity but laid the basis for working with it, a requirement for spaceflight. During his mission – named Principia after Newton’s world-changing three-part text on physics - Tim will spend 6 months living in weightlessness, the first time a British ESA astronaut will visit the International Space Station. Wouldn’t it be amazing if the seeds from a tree that played a role in the birth of the Universal Law of Gravitation could be brought aboard the weightless environment of the ISS and then returned so that we can grow special spacefaring descendants of the most famous apple tree in history? Principia space cider, anyone? We can’t promise anything yet but we’ve started thinking about what to do with Tim’s amazing gift! For the latest news and information on Tim's mission you can subscribe to our email alerts.